Forrest Hill might not be your neck of the woods but we're guessing that won't stop you visiting its newest cafe, William Souter Espresso. 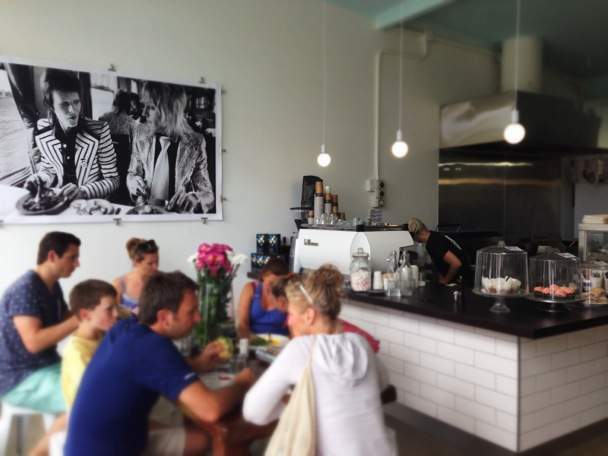 Just north of Takapuna in a suburb called Forrest Hill there's a new café that everyone's talking about. At just six weeks old, William Souter Espresso is definitely the new kid on the block, but its rise to popularity has been swift. The café is located, unsurprisingly on William Souter Street amongst a pocket of local shops including a diary and a liquor store. It's a small yet perfectly formed joint, with a handful of tables outside and more seating inside including a large table – ideal if you are a bigger group. The fit-out has nice clean, urban feel to it with a huge blackboard displaying the menu on the back wall offset by fresh white walls. There is a generous counter (glossy white butcher's tiles with a black top) incorporating a glass display cabinet that houses salads, gourmet rolls and baked goodies and of course, a large bianco Italian espresso machine. Regardless of when you pop in, you can guarantee the café's most regular patrons will be lunching – a sizeable black and white print of 'Lunch on Train' featuring David Bowie and Mick Ronson takes centre stage above the large table. We enjoyed brunch here, dabbling across the breakfast and lunch menu and settling on the upside down beetroot salad – carrot, avocado, coriander and feta with haloumi ($16.5), the breakfast wrap – bacon, eggs, herbs in a toasted tortilla ($11.50), and the smashed avocado with feta and corn salsa on toast ($12.5). The salad was lovely and fresh and a great mixture of complimentary textures and flavours. Thinly grated raw beetroot and carrot worked nicely against creamy avocado and feta, crunchy pepitas and salty haloumi. The breakfast wrap was tasty and filling with a nice amount of herbs and bacon throughout and the smashed avocado looked and tasted downright delicious. The generous amount of smashed avocado on toasted ciabatta with salty feta and sweet corn had an extra kick with loads of lime juice and a little fresh chili on top making it a delight to devour. There are plenty of options on the menu and extras in the cabinet – the day we went there were sweet little boxed rissoni salads on offer and a spiced cauliflower, pumpkin seed and pearl barley salad amongst others. If you've got room definitely take on one of the sweet treats here. We had a piece of Louise slice, which does tend to be hit or miss. This was most definitely a hit with lovely soft vanilla shortcake, real raspberries (rather than the typical heavy raspberry jam) and a generous layer of toasted sweet stringy coconut on top – seriously good stuff. The coffee was good and the service was great, which is one of the lovely things about eating at a decent local. You get the feeling the community has been hanging out for a café like this for some time (it really feels like a one of a kind in this neck of the woods), which was why it was pleasantly busy when we dropped in. And with food this good, we've got a feeling it won't just be the locals popping in for much longer.